20% Off New Collection Orders at La Redoute Get this season's latest styles for 20% less when you use this code! 25% Off Selected Lighting & Plants at La Redoute Shop beautiful home furnishings at La Redoute and get up to 25% today with this code. Enjoy 60% Off Lines in the Spring Sale at La Redoute - Shop Fashion & Home Don't miss! Save up to 60% on selected lines in the spring sale at La Redoute. Discover 60% Off Dresses in the Spring Sale at La Redoute Refresh your wardobe this Spring and save 60% on dresses at La Redoute. Free Click and Collect on Orders Over £50 at La Redoute Qualify for free click and collect on your orders when you spend over £50 at La Redoute. Discover 40% Off Homeware in the Spring Sale at La Redoute Give your home some TLC and save 40% on your purchases at La Redoute. Save £50 on Menswear Clothing & Footwear this Spring at La Redoute Shop the menswear spring sale and save £50 on a range of shirts, trousers, jeans and jackets. Free Returns on Orders at La Redoute Changed your mind? No worries! 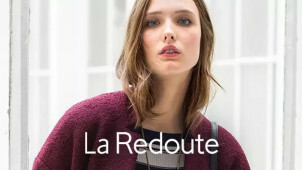 La Redoute offer free returns. La Redoute is a prestigious French mail order company that sells clothing, shoes and homeware globally. La Redoute has been trading since 1837, and has gone from humble beginnings to being a world-renowned fashion brand, working with the creme-de-la-creme of the fashion world to create new collections and statement garments. La Redoute has a big presence in the UK, with head offices in Leeds and London. Designers such as Karl Lagerfeld and Stella McCartney have been collaborative partners in recent years, and you can read the full UK designer timeline on the History section of the website. If you’re inspired by French culture and fashion, then you’ll be spoilt for choice when it comes to shopping online with La Redoute. Everything is affordable, even the designer brand items! You will also find a vast collection of clearance items, so you get even bigger bargains for end-of-line stock. There is a Wish List facility too, so you can save items to review them before to pick your final selection, or share with others if you’re buying presents or splitting the shopping bill with a loved one. How do I use my La Redoute discount code? Be the first to hear about Secret Sales including La Redoute's Black Friday Event and Outlet Sales of up to 70% off when you join the mailing list. Does La Redoute offer Click and Collect? Yes, La Redoute is affiliated with myHermes Parcel Shop, so you can pick up your goods from a local shop of your choice from the myHermes list. Can I get a La Redoute catalogue? You can get a downloadable catalogue from the La Redoute website, or you can request a hard copy to be delivered to your home. It can take up to 14 days for a delivery to arrive. Does La Redoute offer a credit account? Yes, you can apply for a credit account with La Redoute, which has benefits such as try before you buy, spread the costs of your repayments and you’re able to manage your accounts online too. Items are delivered in 3 to 10 days, or sometimes longer if stock is being shipped from France. Fill in the returns form, stating your reasons for return within 21 days and include within your returns parcel. You can send your return parcel back to La Deroute three ways: by Post Office, Courier Collection or myHermes Parcel Shop. Allow 10 working days for your account to be credited with your refund. La Redoute is a ultra stylish French mail order company, adding a bit of oh-la-la to the wardrobes of men, women and children. Why not use a discount code to stock up on French classics like espadrilles and gingham tops. On the La Redoute website you can shop by trend, or go to men, women and kids & baby sections. You’ll also find plus sizes and homeware and garden accessories to complete your French look in all aspects of your life. La Redoute is a very prestigious fashion brand coming from rich, historic beginnings. La Redoute has been trading since 1837, so it has cemented its strong standing in the fashion and lifestyle market by constantly keeping with trends and providing customers with affordable, chic products. Over the years, La Redoute has been lucky enough to work with top fashion models and designers such as Stella McCartney, Karl Lagerfeld and Naomi Campbell. If you want to add a touch of French class to your interiors, we’d suggest you head over to the Home and Garden section of the La Redoute website. Shop by trend, room or brand and then use some La Redoute promo codes to save some money on your purchases. If you’re a bit stuck for interiors ideas, browse by trend, and let La Redoute guide you through the best styles and most up-to-date statement pieces for the home.